During each of your opponent's End Phases: Detach 1 Xyz Material from this card. This card gains effects based on the number of Xyz Materials attached to it. ● 1 or more: Cannot be destroyed by battle. ● 2 or more: Gains 1500 ATK and DEF. ● 3 or more: Unaffected by other card effects. ● 4 or more: Your opponent cannot Normal or Special Summon monsters. ● 5: Once per turn: You can destroy all cards your opponent controls. This card derives its name from Rhongomyniad, a spear that belonged to King Arthur. This is the first Heroic Champion Number monster. This is the first Number monster released in OCG Series 9. This card can be seen as a counterpart to Heroic Champion - Excalibur. Both are named after weapons wielded by the legendary King Arthur; Rhongomyniad being his spear and Excalibur his sword. This monster is DARK, while Excalibur is LIGHT. The ATK of Excalibur is higher than this card's by only 500 points and both have an effect to double their original ATK. This card gains "●" effects based on the number of Xyz Materials attached to it. The "● 1 or more: Cannot be destroyed by battle." effect is a Continuous Effect. The "● 2 or more: Gains 1500 ATK and DEF." effect is a Continuous Effect. The "● 3 or more: Unaffected by other card effects." effect is a Continuous Effect. The "● 4 or more: Your opponent cannot Normal or Special Summon monsters." effect is a Continuous Effect. If "Chaofeng, Phantom of the Yang Zing" is Synchro Summoned using "Jiaotu, Darkness of the Yang Zing" as a Synchro Material, your opponent cannot activate the effects of DARK monsters. If "Number 86: Heroic Champion - Rhongomyniad" has 5 or more Xyz Materials, the "● 3 or more: Unaffected by other card effects." effect is applied, it is unaffected by the effect of "Chaofeng, Phantom of the Yang Zing" and the "● 5: Once per turn: You can destroy all cards your opponent controls." effect can be activated. : If "Chaofeng, Phantom of the Yang Zing" is Synchro Summoned using "Jiaotu, Darkness of the Yang Zing" as a Synchro Material, can the effect of "Number 86: Heroic Champion - Rhongomyniad" be activated? 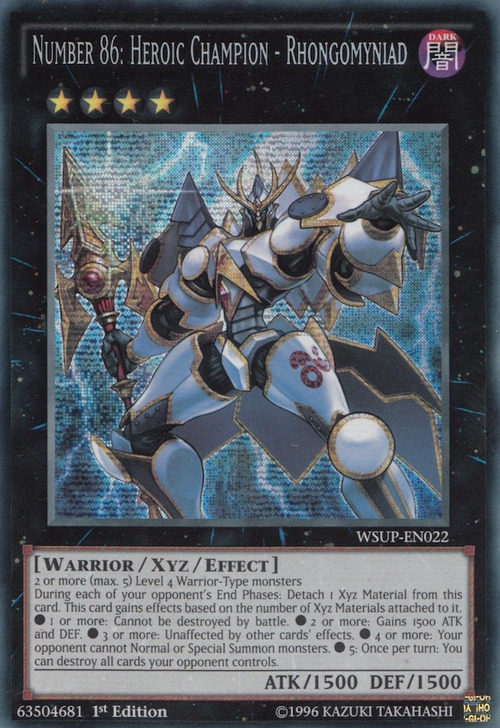 Even if monsters are declared by the effect of "Number 16: Shock Master", if "Number 86: Heroic Champion - Rhongomyniad" has 3 or more Xyz Materials, the "● 3 or more: Unaffected by other card effects." effect is applied and it is unaffected by other card effects. Therefore, since it is unaffected by the effect of "Number 16: Shock Master", the "During each of your opponent's End Phases: Detach 1 Xyz Material from this card." effect still activates. If "Number 86: Heroic Champion - Rhongomyniad" has 5 or more Xyz Materials, the "● 5: Once per turn: You can destroy all cards your opponent controls." effect can be activated. : If monsters are declared by the effect of "Number 16: Shock Master", what happens with the effects of "Number 86: Heroic Champion - Rhongomyniad" if it has 3 or more Xyz Materials?